Steve Moore was born in Ft. Worth and grew up in Paris, Texas. After graduating from Texas A&M University – Commerce, he taught vocational agriculture at Roxton High School near Paris for three years, never thinking he would become a farmer. Moore started farming with 600 acres, picked up an additional 500 acres the next year and today raises cotton on 4,200 acres in Scurry, Fisher, Nolan and Mitchell counties in the Texas Rolling Plains. All of his production is signed into PCCA’s West Texas/Oklahoma/ Kansas marketing pool. Following the passing of PCCA Director Larry Williams, PCCA Delegates in District 8 nominated Moore to represent them. He was officially elected to PCCA’s Board of Directors at the cooperative’s annual meeting of grower-owners on Sept. 20, 2017, in Lubbock. Moore has served in many leadership positions during his farming career. He currently is Chairman of the Board at Central Rolling Plains Co-op Gin in Roscoe and serves on the boards of Big Country Electric Co-op, the Texas Agricultural Cooperative Council and the Scurry County Farm Bureau. 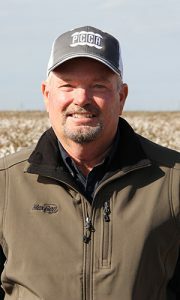 He also has served on the boards of Capital Farm Credit, PYCO Industries, Inc., and Rolling Plains Cotton Growers. Moore and his wife, Renee, have two daughters. Leslie is a teacher in Katy, Texas, and Tara is an adoption counselor in Dallas.